Hello everyone, hope you all had a fab weekend! I spent all day Saturday in work but popped into Cardiff City centre after and picked up this lovely dress from Peacocks. It was £20 which I think is fab as something similar in Topshop would have been about £45. Isn't the lace collar pretty? I had a swap party on Sunday with all of my friends and it was a huge success. A swap party gave me and my friends a chance to clean out our wardrobes and swap unwanted stuff with each other. Swap parties are fun and economical way to find new things we want in exchange for things we no longer need - for free. I highly recommend holding your own party especially if you live in halls of residence because there will be loads of people to swap with. The picture above is of all the things I wanted to swap and the table cloth below them is some fabric I got for £2 in the charity shop, bargain! I came away with lots of sample size make up which is perfect to pop in your bag, a few books and a jumper. I didn't take many photos because we were all having too much fun gossiping and drinking wine. I got these lovely little Hummingbird Bakery note cards in a fab gift shop called Rossiters in the Royal Arcade in Cardiff. They have four different designs and have recipes on the back. If anyone wants me to post them one just email me at gemmasouthgate@hotmail.com. We could swap postcards and recipes :) Getting mail is so much fun. Did you go anywhere nice on the weekend? Got any nice recipes to share with me? Peacocks really do have some nice prints in at the moment, and the lace collar is the perfect detailing. The swap party sounds like a great idea, especially when books and clothes are involved! Love it! I love that you had a swap party...just like I did a while back! Such a great idea!!! @Hannah- Thanks! There is a brownie recipe on some of them tham I'm going to try. I love the idea of a swap party! Also, that dress is so cute - I'll definitely keep my eyes open for it when I'm next in Peacocks. 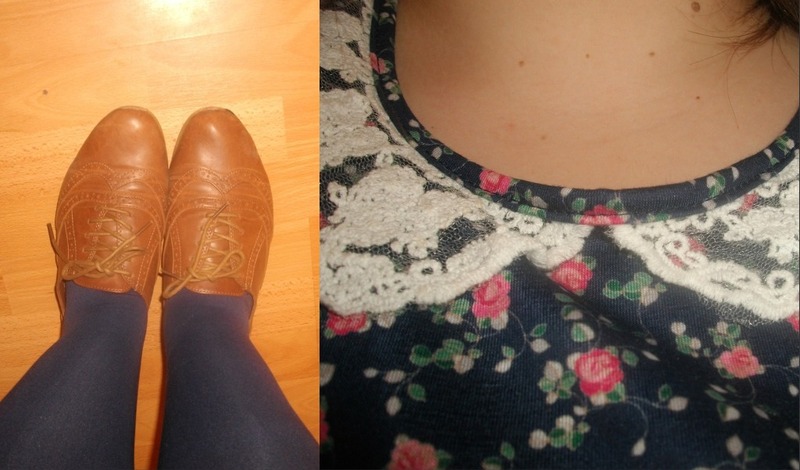 Argh, you just reminded me of a clothes swap that I meant to go to and completely forgot, it was last week! I can't believe I forgot! The Hummingbird Bakery book is the best, notecards is such a cute idea. Thanks guys, Peacocks is really good in Cardiff because the HQ is based there. I think it's probably the flagship store. @c'est freak, le chic- I'm not a very good baker, I buy mine! I love the idea of a swap party.